If you are a person that strongly believes in something and you have set of values that you want to protect even when you go shopping, there are apps that can help you do that easily. But, finding the right app that will make your shopping enjoyable and in the same time protect your ideals it can be tricky. To make the search easier for you, we searched and we found an amazing shopping app that will alert you and protect your values. Let’s see what the app is about. What is Shoulder Angel all about? This shopping app is developed for android and IOS users that have strong belief system and like to protect their causes by finding out which companies, people and stores are selling goods and services that go against the values he has. 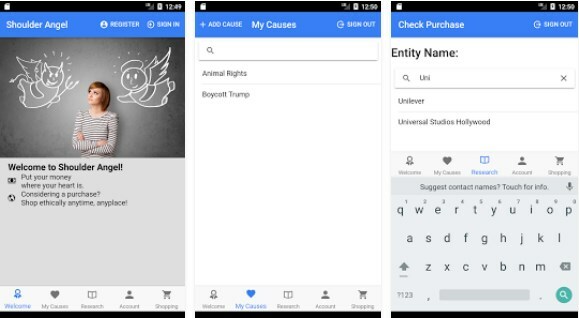 Shopping alerts and warnings are offered by this app, helping users protect his ideologies by simply entering his beliefs and getting lists of places where his values are not appreciated and respected. On the app users will enjoy the incredible and simple interface that will help them to effortlessly protect their beliefs and spend their money in the right places. On this amazing shopping alert app, all shopping addicts and lovers that choose where they go shopping and what they are buying to protect their ideals will be able to do that easily by using this app. Easy and simply, just by entering the set of beliefs in the ‘’My Values’’ tab the user has he will get detailed lists of stores, companies and people that sell goods and services and find out if those places go in favor or against the values and beliefs of the user. With the help of this app, users can constantly keep track of all places they like to shop to while they protect their ideologies and opinions, smartly choosing the places where they buy and spend their money. By using the app, users will always enjoy their shopping time while in the same time strongly protect their belief system and spend their money right! Download it on Google Play and App Store for free to pick your set of beliefs!